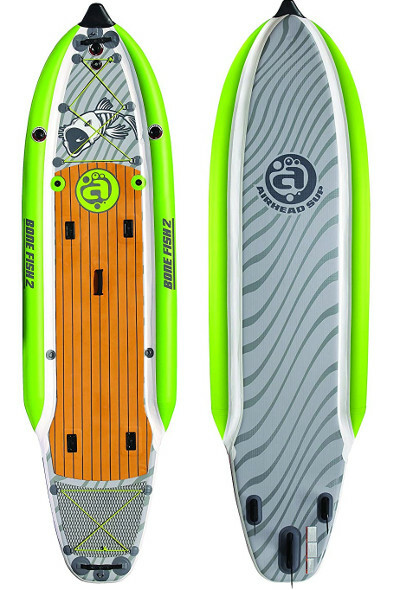 Brands like Airhead SUP made it their main focus to make inflatable standup paddle boards of different sizes and uses along with every accessory needed to for a successful SUP’ing experience. This review is dedicated to every fisherman with us here today because we got the Airhead Bonefish 2 and it’s guaranteed to make your fishing experience a lot more practical and fun. We’ll try to cover everything on this board in hopes to help you see if this is what you’re looking for in an iSUP. 11'6" x 38" x 4"
The Bonefish 2 is an impressive fishing inflatable paddle board; it measures 11.6 feet in length, 38 inches in width, and it is 4 inches thick. It’ almost as long as racing iSUPs which means you’ll get so much space where you can put a cooler, a seat and a whole load of other equipment and cargo. Now what I really want to talk about is the 3 valves this board got. Usually, only one valve is used to inflate the iSUP; but with this one, you’ve got 3 separate air chambers to take care of; the main chamber, and then the two extra ones on the sides that resulted in making this iSUP a whole solid platform for maximum stability. Given what’s just been stated, I honestly expected the Bonefish 2 to be nothing less than 6 inches thick, but it only got 4 inches. It’s definitely not a deal breaker especially that you’ll be getting 2 extra side air chambers to support any additional weight on board. Airhead SUP is doing a great job making all of their inflatable standup paddle boards using military grade PVC material that’s universally known for being the toughest material to make any inflatable flexible yet durable. The Bonefish is a rigid iSUP and you can see and feel that once you inflate all of its chambers. 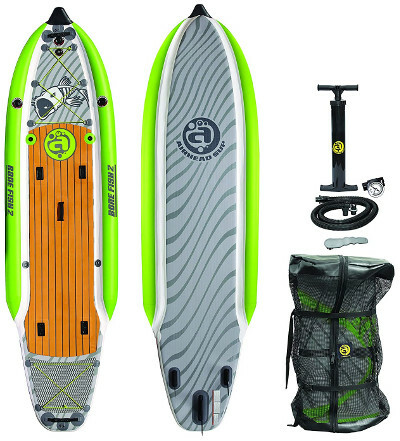 Also, the X-Cross technology used to construct this board causes it to be extra stable and responsive with the ability to perform some maneuvers in rough waters making it a versatile iSUP that can serve different purposes. Brace yourselves; this is going to be a long section because the Bonefish 2 is loaded with features and specs that bring its value higher than you could’ve thought. 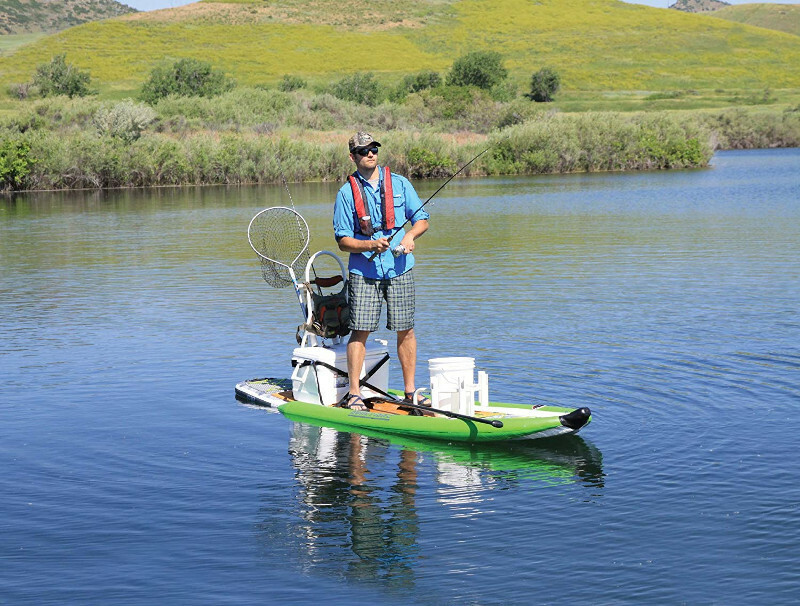 Let’s state the obvious; this board is featured with 2 extra side air chambers as previously mentioned to enhance its stability and resistance when taking on some big fish or white waters. It’s something you’d only see on fishing iSUPs or those designed for rapids to maximize safety and security. Next, there is the EVA traction pad that covers half the board’s back; it comes with somehow a woody graphic design that I found simple but not very attractive to be honest. However, it’s soft, grippy and it covers all of the area where you’ll be moving or sitting on. Also, you’ll find 3 carry handles to transport the inflated board with a little help if available. Another thing that goes with the number 3 is the navigation system; the Bonefish 2 is featured with a trio-fin set for best tracking results. The large fin is 9 inches long while the other two are 6 inches and they’re all removable. More than that, there are 2 storage areas on this board; one on the deck and another at the end of the board with its own traction pad. Both areas are featured with a total of 10 D-rings with bungee cords connecting them. It’s so much room honestly and that’s something a fisherman who spends long hours in the water would totally appreciate. 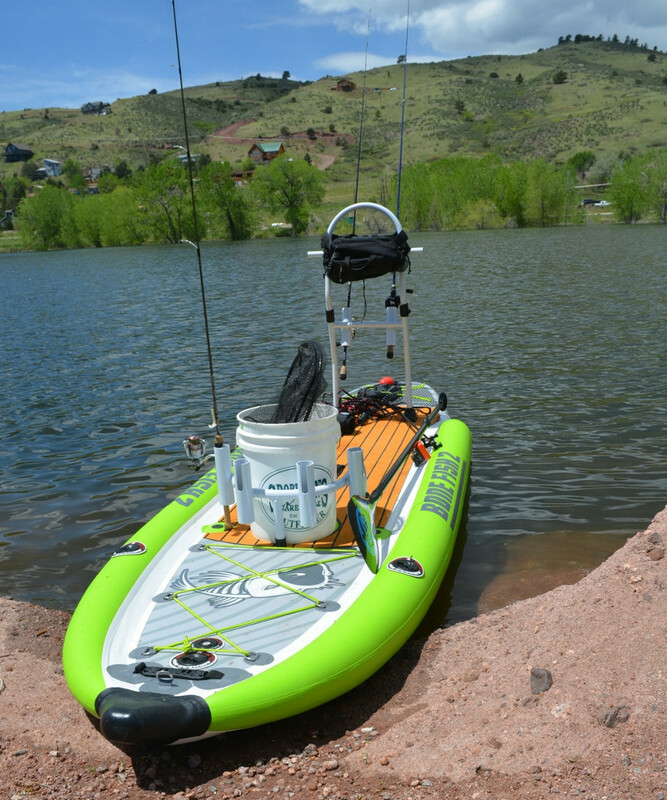 Now to make this board 10 times cooler and more practical, Airhead featured it with 4 integrated mount pads where you can put 4 fishing rod racks or a bucket rack. It’s the perfect fishing iSUP because every small detail is carefully taken into consideration. Moreover, you’ll find 2 extra smaller mounts that’ll allow you to attach a camera to the board for documenting purposes, or you can put some smaller rods in them; the more rods you use the more fish you get. 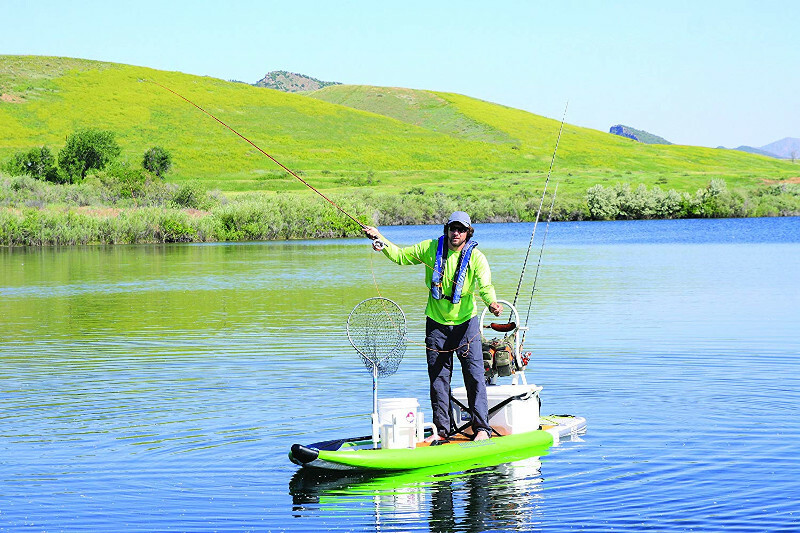 impressive fishing inflatable paddle board. A board strap and a repair kit. Yes. Sadly; there is no paddle included which we hope you can work it out using an old paddle that you have or buy a new one. If anything at all, the Airhead Bonefish 2 is a stability monster. Taking any cargo or accessories with you on board, this iSUP will remain on a straight tracking line smoothly gliding in a total ultimate float. What’s even better than that is that the Bonefish 2 delivers a great performance when it comes to touring; the side chambers and X-Cross technology added immensely to the way it deals with rough water, critical turns and maneuvers. As a result, the Bonefish 2 is an ultimately versatile iSUP that’s also stiff, durable and extremely functional. The Bonefish 2 is a great fishing/touring iSUP. It’s loaded with features that make it the most practical and functional fishing iSUP. Another 2 smaller integrated mounts are also features for smaller rods or camera attachment. Storage area on the deck and on the board’s tail with 12 D-rings in total including the safety leash D-ring. The Bonefish comes in a nice package with quality items. A paddle to be included in the package. And the iSUP to be 6 inches thick instead of 4.